The Interactive Metronome (IM) is a research-based training program that helps children (and adults) overcome attention, memory, and coordination limitations. detecting where a sound is coming from (as sound hits one ear microseconds before the other). Many scientists believe that neural timing deficits are part of the cause in ADHD, Dyslexia, Autism, Reading Disorders, Auditory Processing Disorder and other conditions. By addressing timing in the brain with Interactive Metronome (IM) alongside functional therapy interventions you are not only addressing areas of ability that impact achievement and independence but also the heart of the problem, that of deficient neural timing within and between regions of the brain that are underlying many of the problems you are working on in therapy. This leads to more efficient treatment and better overall treatment outcomes. Interactive Metronome’s game-like auditory-visual platform engages the patient and provides constant feedback at the millisecond level to promote synchronized timing in the brain. Exercises can be customized and involve a hierarchy of increasingly complex and precisely timed motor movements intertwined with gradually higher & faster cognitive processing, attention and decision-making. Interactive Metronome is the only neuromotor therapy tool that can be used successfully with all patients across the therapy spectrum, even those that require total hands-on assistance due to cognitive and/or physical impairments and those that are very young. 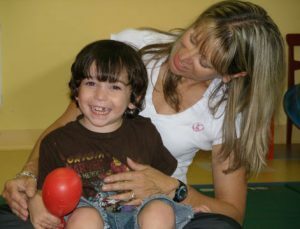 Rather than simply performing repetitive movement or cognitive activities to achieve functional gains, therapists that incorporate Interactive Metronome into functional therapy activities report their patients are more engaged, more alert, complete far more repetitions of functional movement patterns and activities in a more precise and timely manner, and demonstrate faster progress toward cognitive, communicative, and physical therapy goals. Patients who are challenged and can see measurable improvements are more motivated to continue their therapy. Working memory – the ability to store information and ideas. Attention on information and the ability to ignore distractions. Bergen Pediatric Therapy Clinical Director Lisa Koo and Occupational Therapist Kathryn Polidoro are both certified Interactive Metronome Providers.